For other places with the same name, see Fife (disambiguation). Fife is a county in the north east of Scotland. West Fife includes areas from Kincardine to Aberdour, including the ancient capital of Scotland, Dunfermline, as well as many historic towns and villages such as Culross and Limekilns. Central Fife includes the areas around Cowdenbeath, Lochgelly, Kirkcaldy, Leven and Glenrothes. North Fife includes areas around St Andrews, Leuchars, Cupar and villages along the Tay, as well as the farmland valleys of the Howe of Fife. 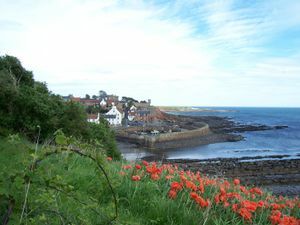 The East Neuk of Fife (pronounced like "nuke") is the coastal stretch beyond Leven leading up to St Andrews taking in villages such as St Monans (with its windmill), Elie (with its Blue Flag beach) and Crail (with its red tile roofs). Many tourists find themselves paying most attention to St Andrews and The East Neuk. Falkland and Culross are also well worth visiting, and other areas provide facilities and subjects of interest: for example, Kirkcaldy is the birth place of Adam Smith - the "father of modern economics". Aberdour, described as "the jewel in Fife", Aberdour is a stunningly attractive coastal village. Burntisland, a small town on the Firth of Forth. Culross, a charming 16th and 17th century restored town. Dunfermline near the Forth Bridges, with an interesting Abbey. While Fife is often looked upon now as little more than the southern commuter belt to Edinburgh and the town of St. Andrews its people are very proud of their past. Fife has a history steeped in Economic achievement - from it's founder father, Adam Smith (born in Kirkcaldy) to perhaps the world's greatest buisnessman/philathropest, Andrew Carnegie (born in Dunfermline). This current tradition is upheld by the last UK Prime Minister, Gordon Brown. The major language (as in the rest of Scotland) is English, but the Fife acccent can be difficult to understand (for those not used to the variety of accent in the UK, and not as difficult as some areas of Scotland). Many people, as in much of the rest of Scotland, use a form of English known as 'Lallans' or Lowlands English which does include some words that you may not be used to (for example "aye" for "yes" or "ken" for "know"). "Braw" is used locally as a word for general approval that you may be unfamiliar with (even having experience with speaking to Scottish people). As in "That'd be braw" meaning "That'd be fine/great", or simply "Braw!" meaning "Great!" or "OK!". However, you need fear not! Speaking (standard/normal/American/Australian/English) "English" will not make you incomprehensible to Fifers, and Fifers will generally try to make themselves understood to you if you have problems with the dialect (I wouldn't push it too far in a pub later on in the evening, however). As with the rest of the UK do not expect foreign language capability to be great, or even good (with the possible exception of areas such as St Andrews where the people are more used to tourists). Most people are educated in French or German, some in Spanish or Italian, but generally not to a conversational level (that they remember!). There are, of course, exceptions to this rule. Edinburgh Airport  (EDI) is the most convenient airport for most of Fife. Edinburgh airport is well served from across the UK and some European cities by the likes of BA, BMI, easyJet, flyglobespan, flybe, Scotairways, Lufthansa, Air France and KLM, and now also has direct flights to the USA with Delta and Continental. There's a bus service (747 line ) direct to Inverkeithing from the airport, where you can change for another bus or for the train. It takes from 25 to 45 minutes (depending on the traffic). Fares are £4.50 single or "day return", half for children. Otherwise, get the bus/taxi into Edinburgh and catch the train from Haymarket or Waverley. You could of course also hire a car. Glasgow airport is about a 90 minute drive from the Forth Road Bridge (entryway to Fife). There is also a small airport in Dundee that has commercial scheduled connections from London City (with Scotairways) - this airport is convenient for some of Fife also. Fife Airport  is found in Glenrothes - there are no commercial scheduled flights to this airport. Trains from Edinburgh (or further south) to Dundee (or Aberdeen) stop at Inverkeithing, Aberdour, Burntisland, Kirkcaldy, Markinch and Leuchars (for St Andrews). You can use the East coast service on the East Coast Mainline directly from London to Kirkcaldy, though this is a long trip. There is also a very good local or 'circle' service which services Dunfermline, Rosyth, Thornton (for Glenrothes, although Markinch is also handy) and other towns. Use the M90 motorway to access Fife from the north (Perth) or south (Edinburgh). A92 gives access from Dundee/Aberdeen. Also easy access from Stirling to Kincardine/Dunfermline via A985. A92/A985/A91 are major trunk routes through Fife. Major bus stations in Kirkcaldy, Dunfermline, Glenrothes, St Andrews Inverkeithing and Cupar are served by Stagecoach among others (for example, some Megabus services make stops at Inverkeithing). See above for details of getting to Fife by bus from Edinburgh airport. Roads are in generally good condition and not too crowded. The only motorway (the M90) passes straight through Fife, and the dual carriageway network is limited - so only drive if you feel comfortable on single carriageway roads, and some even smaller roads. To get around most areas (including to get to St Andrews) you will need to take trunk roads and through towns. Many of these towns have traffic calming schemes in place that can be difficult to negotiate (for example in Colinsburgh) or have through roads that are very narrow (or have parking on one side) where traffic can only really pass in one direction at a time (for example in Kingskettle). Don't let this put you off, though - take your time and remember to drive on the left (keep yourself as driver and the steering wheel towards the center of the road at all times, just as at home!) and you can see some of the best parts of Fife - the North Fife Tourist trail through the East Neuk is a fantastic route to drive to St Andrews, stopping in the picturesque villages en route. Falkland has some bad blind corners, so take care. Generally speaking, the most convenient way to get from Edinburgh (Airport) to St Andrews is to hire a car and drive - especially if you're arriving with golf clubs! Check Traveline Scotland  for full details of public transport and a journey planner. There is an excellent series of cycle tracks  throughout Fife. The cycle route from Edinburgh to Aberdeen also passes through Fife. On foot you can take the Coastal Path  which starts (and ends) at the Kincardine, Tay or Forth Road Bridges. Secret Bunker: a former underground nuclear bunker now open to the public. East Neuk: charming, photogenic fishing villages (includes Elie - with a blue flag beach, Pittenweem, Crail and Anstruther). Aberdour Beach, scenic harbour, castle. Visit the county's many fine parks (Beveridge in Kirkcaldy, Pittencrieff in Dunfermline, Lochore Meadows, etc). The Bengal Tiger Indian Restaurant at Pittencrieff Street, Dunfermline, near to the park, offers excellent food, and has special half price offers every Sunday to Friday night inclusive. For Fish & Chips (or Ice Cream!) try the Anstruther Fish Bar , which has won awards. Be ready for a long queue at busy times, though. The Pavilion  in Elie is actually a (golf) pavillion, but offers good food (including local seafood) at a decent price. It's also an Internet Cafe. If you're more adventurous, try lobster directly by the harbour in Crail (look for the small wooden hut). Fife has many pubs, every town or village will have at least one with most having two or three. Crime in Fife is low, and serious assaults are uncommon. As always, it makes sense to avoid badly lit areas at night, especially in large towns, even though there is a slim chance of crime. Fife is served by an excellent police service. This page was last edited on 9 September 2015, at 14:43.